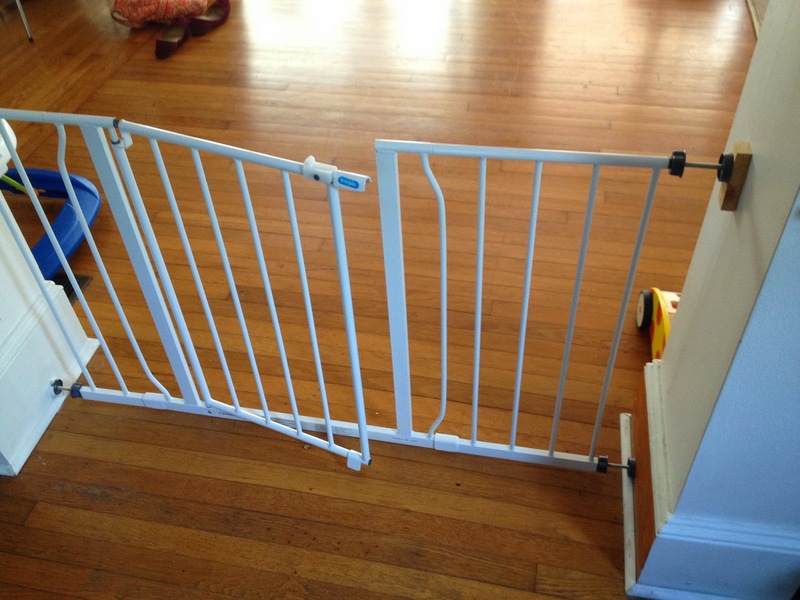 When you have a baby and you like design, baby gates can be a real pain in the... decor. You want something that looks nice but functions well. We currently have five baby gates and they happen to be all different because of the different needs of all the openings. Our little product tester has been using and abusing these things for a few months now so I thought it would be the perfect time to give you the pros and cons of each gate. I'm splitting this into two posts since it is overwhelmingly long as one! 1. Carlson 0930PW Extra-Wide Walk-Thru Gate with Pet Door, White $38.99: This gate goes out to the sunroom which is the dogs area so we wanted a way to get back there on their own. 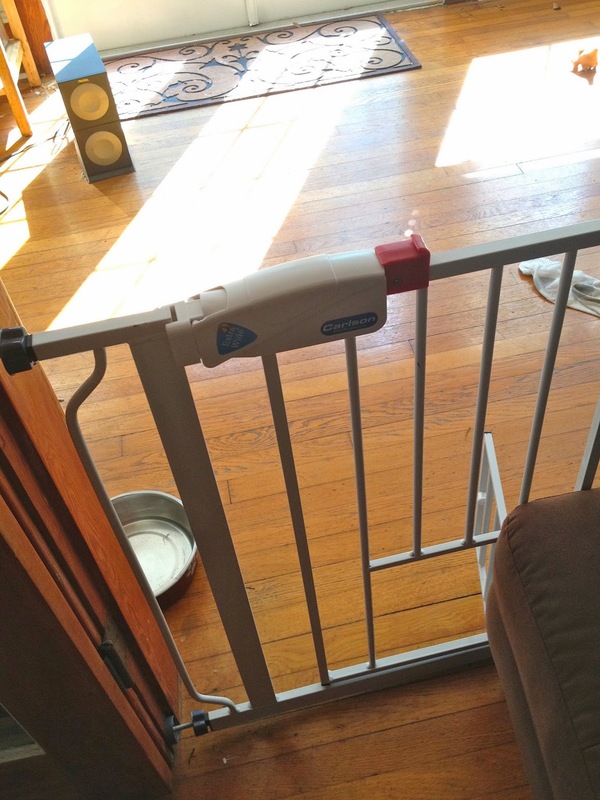 When we found a baby gate with a doggy door, we were sold. We installed this so that one of our french doors has to remain shut and we do not use the extra panel to make it extra-wide. Dog door with lock so we can keep the dogs in this room if we want to. Opening and closing the dog door serves as hours of entertainment for Will. Will recently figured out how to open this gate if it isn't fully latched with the red lock. The little handle on the dog door lock kept falling off so we had to super glue it back on. Would we buy it again? Absolutely. Despite the minor cons, I really love this gate. It works so well for us and if you have pets and a baby it really gives you a lot of flexibility. We were initially worried the dog door was too small but our dogs go through fine and we've had a cocker spaniel and even a 60 lb hound mix go through just fine. 2. 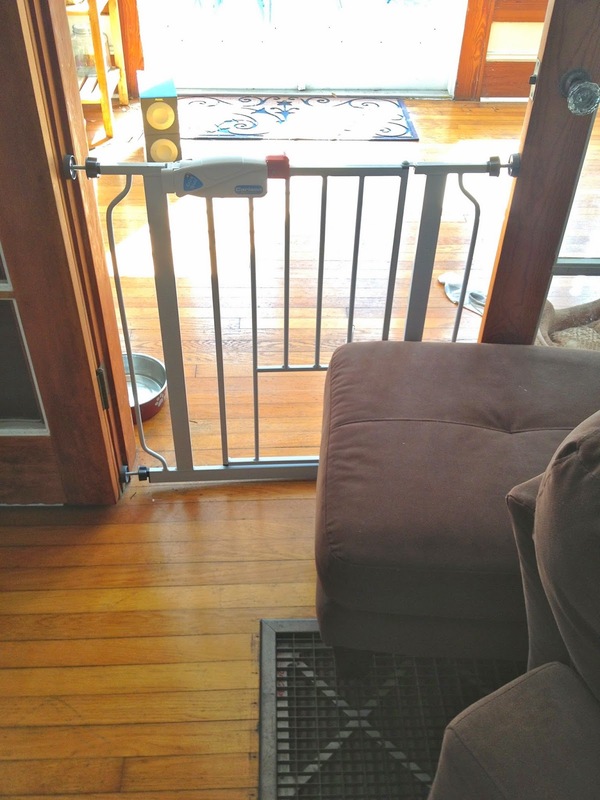 Regalo Easy Open Expandable 52 Inch Super Wide Walk Thru Gate $32.99: We needed a wide gate for our main living area entrance that we could easily walk through. This one hit the mark for a pretty cheap price so we went for it. We did nee to use blocks on the tope to match the width of the door with the trim at the bottom. Will can't and won't be able to open it for a loong time since you have to do two things to open it. Would we buy it again? Ehh... maybe. If it holds up to Will for awhile longer, then it was an OK gate at a pretty good price so if I couldn't find a better gate at a decent price I would consider this one again. Links are not affiliate ads... just a place for you to find them for sale. Want to see more? Click here for three more gates to consider.